The ¡Latin Food Fest! will take over San Diego with an array of exciting events from September 12-15. Featuring classes, seminars, tastings, special dinners, and a host of premier offerings, the inaugural Latin Food Fest will kick off its 10 city tour starting in America's Finest City. In anticipation of this occasion, SanDiegoVille will be posting details about the Latin Food Fest's special events, starting with the Grand Tasting, set for Saturday, September 14! 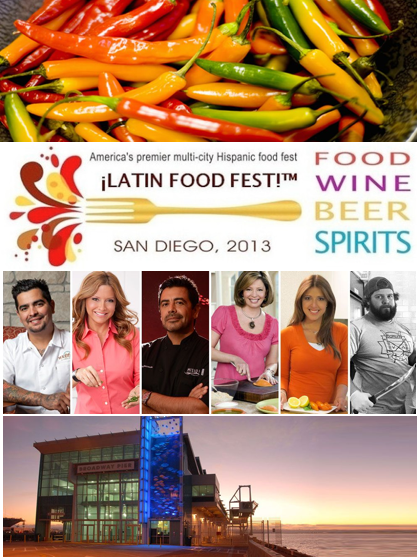 Latin Food Fest has announced the details of the festival’s main event - the Grand Tasting - a lavish occasion featuring celebrity chefs Ingrid Hoffmann, Daisy Martinez, Doreen Colondres, and Aaron Sanchez, as well as an impressive lineup of fantastic local chefs from San Diego and Baja. This superb event is set for Saturday, September 14 from 11:00 am to 3:00pm at the picturesque Port Pavilion on Broadway Pier. Don't miss out on an afternoon of Latin wine and craft beer tastings, ceviche bars, silent auctions, live music, book signings, art showcases and all-you-can-taste tapas-sized samples of international cuisines from over 100 restaurants and food purveyors. 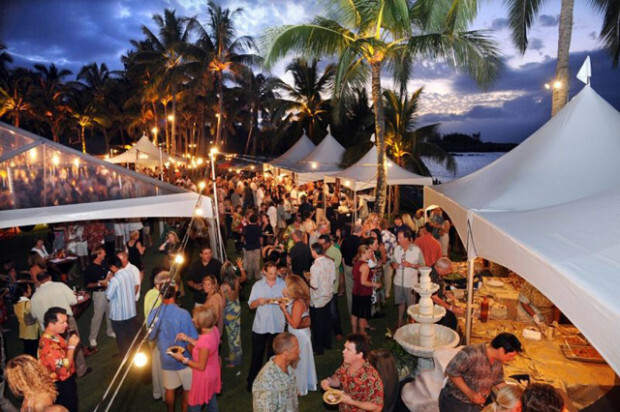 The Grand Tasting event promises to be a foodie’s dream come true. In addition to all you can eat and drink, attendees can sit in on discussion panels on the history of Latin cuisines and learn the latest trends in Latin American cooking, sample Cali’s true flavors in the “Baja is Back Pavilion”, and watch as celebrity chefs pair up for food demonstrations that show off their charm and culinary prowess. Eat and drink for a good cause, as the Grand Tasting is now working towards a humanitarian goal by partnering with The Jacobs & Cushman San Diego Food Bank to benefit the Childhood Hunger Initiative Media Arts Center and The James Beard Foundation to provide culinary scholarships to students in need. What other chefs will be attending the Grand Tasting? The list is long and impressive, and includes Chef Chad White of PlanCha Baja Med in San Diego, Miguel Angel Guerrero from La Querencia in Tijuana, chef Pablo Salas of Restaurante Amaranta from Toluca, Mexico, Isabel Cruz, Paul Bauer of Café Sevilla, Javier Plascencia from Mision 19, Chef Lala, Martin Gonzalez of Acqua Al 2 and Drew Deckman from Deckman's en el Mogor and Deckman's San Jose. Tickets for the Latin Food Fest Grand Tasting Event are $55 for general admission, $70 for one hour early admission and $99 for VIP, which include access to the VIP Playa, which will be stocked with reserve wine, specialty tequila and the finest gourmet Latin cuisine, and your own special goodie bag full of gourmet products, magazine subscriptions, incredible restaurant coupons and kitchen items. In the VIP Playa, celebrity chefs Aarón Sánchez, Ingrid Hoffman and Daisy Martinez will be on hand to autograph copies of their latest best-selling books, and VIPS can relax in the Beach Bar and a BevMo! Lounge stocked full of premium spirits and specialty take home gifts. Get your tickets now for what might be the most delicious education you'll ever receive! For more information, visit the ¡Latin Food Fest! official website.